Students, both those familiar with Falvey’s website and those new to it, will appreciate the major upgrade to the site this month. 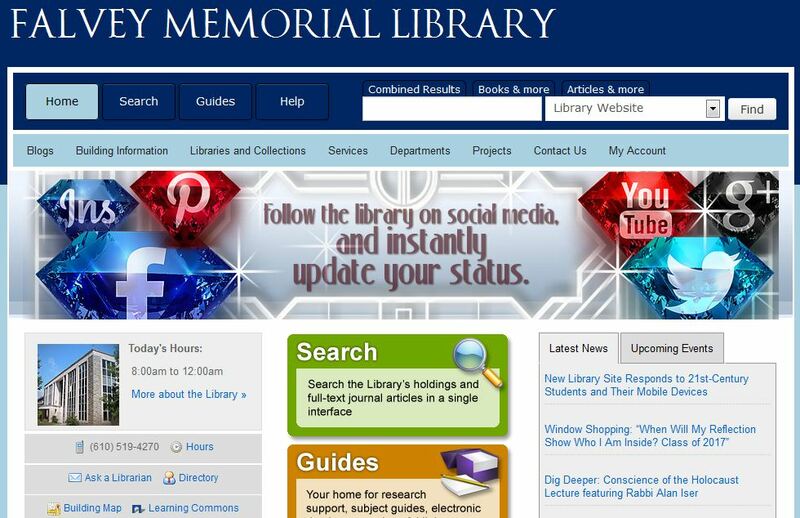 The library’s Web Development team* designed the new site to be more modern and responsive “to the host of new screens and devices now widely available and used by our patrons,” according to David Uspal, senior web specialist for library services and scholarly applications. The team achieved this goal with web pages that will reformat themselves “to fit on your screen in a clean way, shifting elements around to maximize screen real estate on all sorts of devices, from desktops to tablets to phones.” Users can observe this capability on their computers by shrinking the window’s size. As it gets smaller, “the elements on the page dynamically adjust to fit the size” of the window. Goal 2) To be “Fashion Forward” (Promotion)—Falvey’s web pages should stay current with modern design standards. Visitors to Falvey’s newly designed site will observe strong similarities to other University pages in layout and format, while retaining the library site’s color themes to aid in navigation. Villanova students played an essential role in the new website’s design. Randomly selected student volunteers participated in usability testing, performing a number of tasks to explore the website’s functionality. Their testing and feedback informed the site designers’ work. * Falvey’s Web Development team members include Laura Bang, Digital and Special Collections curatorial assistant; Robin Bowles, nursing/life science librarian; Kimberley Bugg, team leader, Information and Research Assistance and service development; Kristyna Carroll, research support librarian for business and social sciences; Christopher Hallberg, Library Technology Development specialist; Demian Katz, Library Technology Development specialist; David Lacy, team leader for the Web Technology and the Library Technology Development teams; Jutta Seibert team leader – Academic Integration; and David Uspal.